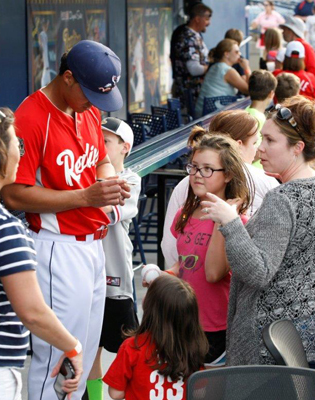 Over the team's 51-year history, the Reading Fightin Phils have constantly improved the 67-year old FirstEnergy Stadium with ballpark renovations and enhancements. In 2016, the red carpet was rolled out to fans with the Savage61 Dugout Suite, the team's newest addition to America's Classic Ballpark. Unlike any area in Minor League Baseball, the Savage 61 Dugout Suite puts you in the closest seat to the action on-field, located just feet away from the diamond on the first base side! With covered seating, handicapped accessibility, and the most unique view around, your group will thank you over and over again for this one of kind experience! 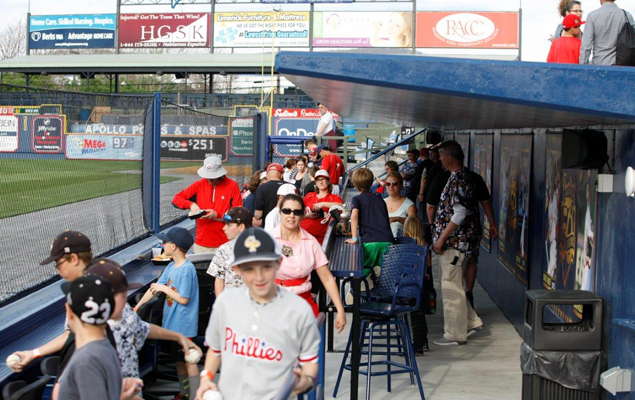 Tickets for the new area are $25 and include the option to add food and drink through the Fightins Concierge Program. Fans can reserve the entire area for 56 people or book any amount of tickets. **Send an email to Jon Nally with all of your contact information, select an available date and list the amount of tickets you will need. Your reservation is not complete until you are contacted by an Reading Fightin Phils representative and given confirmation. Please allow up to 2 business days to be contacted. Thank you for your interest in Baseballtown and we look forward to making your outing a homerun!